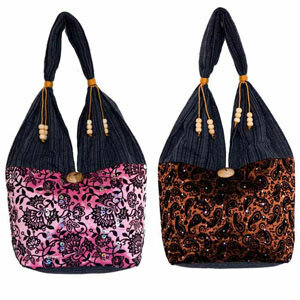 The Lanna artisans handcraft this elegant set of shoulder bags with cotton and polyester. Shiny silver sequins enhance the floral motifs. Golden cords and rain tree wood beads adorn the straps. They are lined with cotton and fasten with a hoop over a button carved from rain tree wood.